Yeah! I finally managed to make Macarons after two failed attempt (no feet) and can you imagine i have use 600g icing sugar and 600g caster sugar, total 1.2kg sugar !!. 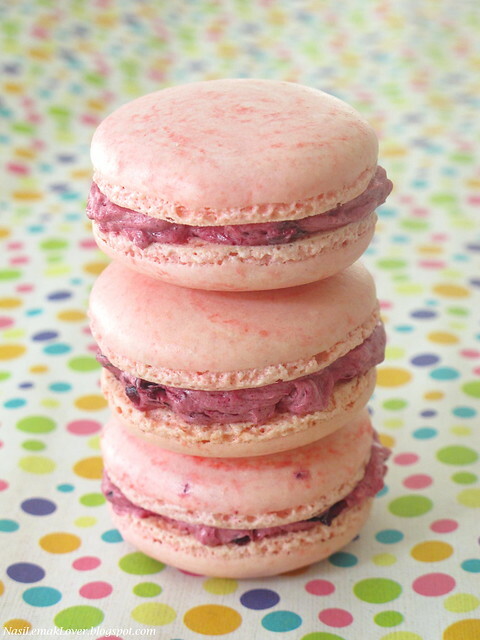 Actually i was not too sure how a good macarons should taste like until i tasted Earl Grey Macaron with Blueberry Compote Buttercream from The Sweet Spot, thin crust and little bit chewy on the inside. Actually this was not my 1st time made macarons. The 1st time i did a direct meringue method, no doubt it still look like a macarons with feet but i prefer the texture of this new recipe. After 2nd failed attempt, I called to The Sweet Spot and realized that I need a themometer as the requirement of 118C is a must !! and I have more confident after see Wendy's success macarons using the same recipe. Thanks a lot to Swee San and Wendy ! This was the first tray (at 3rd attempt), plain macarons and no drying and resting needed, straight put into oven after pipping. 2nd batch, i started to play with colours! 1. Sift almond meal and icing sugar in a mixing bowl, set aside. 2. Cook sugar and water until it reaches 118C. 4. When syrup reaches 118C (remove from heat when reaches 116C because the temperature still increase using the remaining heat), pour it into egg whites on low speed. 5. Turn speed to medium high and beat meringue until stiff and glossy. While beating meringue, mix almond mixture (no 1) with egg white and salt, set aside. 6. Stir 1/3 of meringue into almond mixture and mix well. Fold the balance meringue. 7. Place batter into a piping bag with a plain 1cm nozzle. Pipe dollops of batter onto a lined baking tray (I used Tesco’s baking paper and they are easy to be removed). 9. Bake for 14 minutes on the lower 3rd of oven. 13. Remove from tray (with paper) and let it rest on a rack to cool down. 1. Place blueberries, sugar and a squeeze of lemon juice into a pot. Let it cook for 2-3 minutes. Taste. Let it cool. 2. To make the Italian Buttercream, first cut butter into knob sizes and let it chill in the fridge until ready to use. 3. In a pot, add in caster sugar and water. Bring to a temperature of 118 C. When the temperature reaches 110 C, whisk the egg whites in a mixer. By the time the sugar reaches 118 C, the egg white should be in medium peaks. Gradually stream in the sugar syrup while the mixer is still on medium speed whisk. 4. Whisk till it’s somewhat glossy and that the bowl is not so hot, remove the butter from fridge. Add in a knob into the mixer (while the whisk is still running) one at a time. If you add the butter when the meringue is still very hot, it turns soupy. If you add in the butter when the meringue is cold, you get a split buttercream. After all the butter has been added, whisk for another further 2-3 minutes. If it’s still warm, chill in the fridge for 5 minutes before you whisk it up again. 5. The buttercream should be glossy and buttery. Now, add in the blueberry compote. 6. 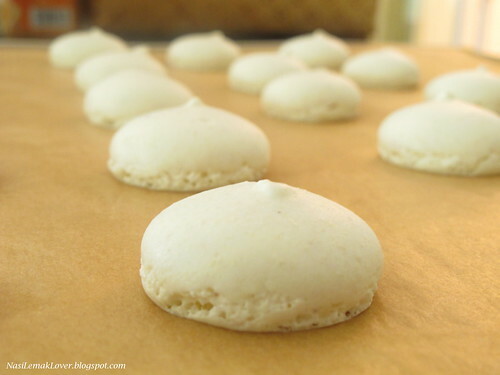 Pour buttercream into a piping bag and start piping dollops of creamy buttery goodness on the macaron shells. 7. Sandwich with another macaron shell, ligtly press it to secure. Then arrange them on a tray or plate or container and let it rest in the fridge, preferably overnight. It taste much better the next day. **FYI, i use the egg white from the eggs that store inside the fridge. I haven't made this before...I want try when I free. So envy u gals made such beautiful macaron. I have never tasted home-made macaron before. Nice macaron should have a bit chewy texture. I think I shall bookmark this recipe too. I was surfing the web in search of good asian recipes and I came upon your blog. I must say you are doing an awesome job! Your recipes are so yummy too! Thanks for sharing with the world. Your macaroons are yummy! I will surely come and visit your blog again. You must be feeling ecstatic when you see little feet appearing, isn't it? That is the satisfaction of baking macarons. 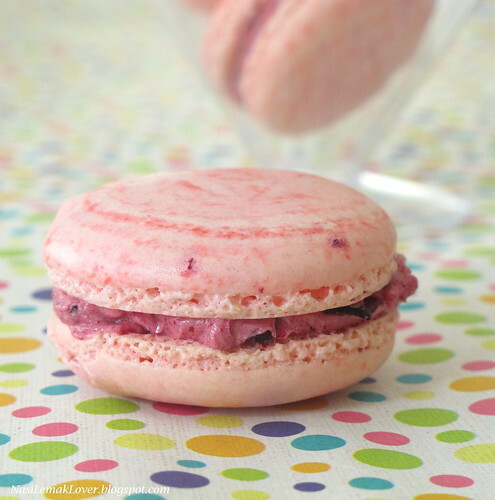 I prefer baking macaron using French method than Italian. But still, your macarons looks lovely and tempted me to have a taste of it! Your macarons look beautiful! I like the colour combo! Congrats on those beautiful macs. I saw you got the baking paper oredi. Nice to use right? Congrats! Both your's and Wendy's macarons looks so beautiful. sangat pandai lah! Give u a big hug n clap for u :) Well Done! may i know where do you purchase green tea powder? Wow, all your macarons are beautiful with very nice feets. I too find the macarons way too sweet for my taste. I like making them and normally give it away to my neighbors since they like it a lot. Congrats Sonai, you have finally done it. And what gorgeous looking macarons as well .. very nice feet! looks absolutely inviting,drool-worthy and super tempting..
beautiful!looks like i have to invest in a good thermometer to make these!! Yum! Mouthwatering. They are pretty. When I see such an accomplishment I feel sooooo small! I am in awe of your baking skills. 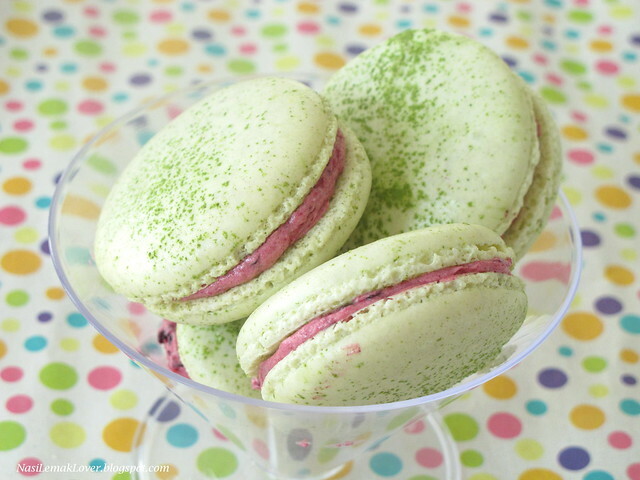 I only tried macarons once in my life and the defeat was huge so I never repeated the experiment. These turned out beautifully, Sonia! Yeah..congratulations! The macarons look cute and as your expectation (the macarons are wearing beautiful lacey petticoat underneath) hehe!! Perfect macarons! Looks very pretty and elegant! I have always wanted to try at making them! You did a great job! I have never tried making macarons. Yours third attempt came out beautifully! I like the blueberry compote buttercream. Macarons are very popular in Australia now, thanks to Master Chef Australia and a 3hrs class of making macarons costs aud$175(it was conducted by a pro from a 1 hat-chef restaurant). Yours look very pretty. I like pink very much but didnt realise that you needed so much of sugar in making them. So roughly how many can you make in total? 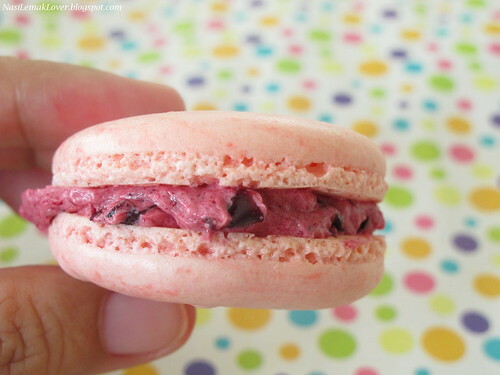 Cute pink macarons are inviting me verymuch. Love them absolutely. 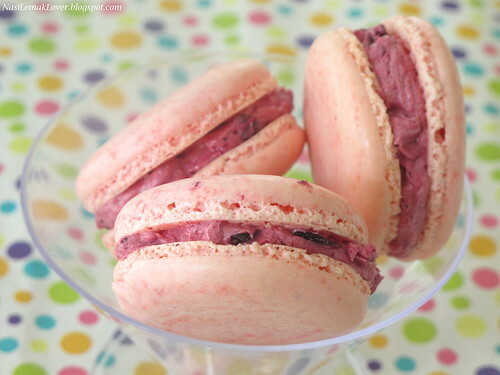 oh, YUM, I've never made these kinds of macaroons before, but you sure make me want to try! Congrats on these beautiful macs. Oh my goodness Sonia... You did it!!! Such a gorgeous and delicious macarons! If you used that much sugar, imagine how much I would end up with (lol). I have sweet tooth and that already scares me. I make macarons fail, eat, try again and fail, eat... continue.... This is so lovely! I better buy just one macaron to enjoy before I go crazy (I am crazy already). 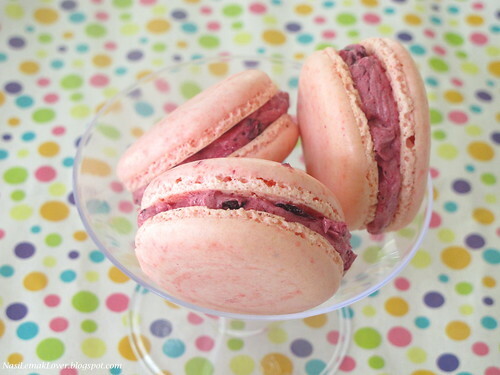 Cheers to your successful macaron making! Sonia!!! macaron anda sungguh cantik.Cm dah cuba 3 kali dan semuanya gagal.tapi tk pernah rasa nak give up so i will try this recipe soon:)Practice make perfect kan hehe. They are very beautiful! 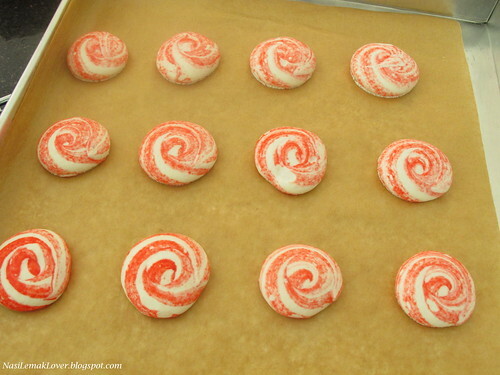 Especially the red swirls on the specific ones! They are just your art-piece! Definitely worth the effort of mastering this technique. Looks nice and delicious but not healthy. 1.2kg sugar.. must be very sweet. BeeBee, you need to use a thermometer to measure the temperature of 118c for the syrup. The two failed attempts i did not measure the temperature. As for the rest of the steps, just followed exactly, and i bet you can make it. Ya, one more thing, i also changed to non-stick baking paper (Tesco brand as told by Wendy) instead of teflon cloth and normal baking paper for the two failed attempts. Good luck for your next attempt. Thanks Sonia for the prompt response! Okay, will use candy thermometer the next time. But as for the Tesco brand non stick baking paper, I probably can't access to it. No Tesco here in Sg. :P I'll try non stick baking paper but other brands for now... Fingers crossed! Thanks again! Instead of blueberry,can I exchange it with something else?? strawberry or orange or maybe something else?? Kaz, yes, you can replace with strawberry, cherry , raspberry or other type of berries. 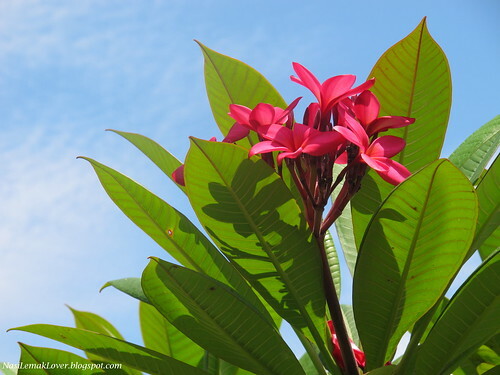 Hi Sonia, it's look so beautiful. Will it too sweet with this recipe or just nice. Ang Wei Lih, just eating the plain macarons, is very sweet. If enjoy with blueberry compote, then the taste just alright. sonia, can lesser the sugar ingredient if prefer less sugar? Y I really can't get feet? To avoid that the meringue is to hot or to cold for the butter, you can use butter at room temperature, cut in cubes/pieces and add one cub/piece at the time at the meringue once it has cooled.